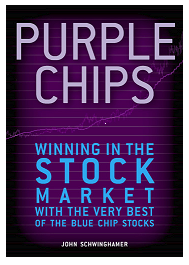 Purple chips is author Schwinghamer's invented term to describe the best of the blue chip stocks. In his definition found on the book's website, purple chips are large companies with a market cap minimum of $1 billion which have an unblemished track record of seven years growing earnings per share (EPS). The book lays out Schwinghamer's method for long term trading in the purple chips, i.e. his method for picking when to buy and when to sell. The method is designed, in his analogy, to hit singles and doubles, not to try for the home run. The method appeals to common sense since it is based on two factors - first, the idea that in the long term the stock price is determined by EPS (what Warren Buffett said thusly: "If a business does well, the stock eventually follows"); second, the fact that markets go through periods of optimism when investors are willing to pay more for earnings (reflected by rising P/E multiples across the board), or the opposite pessimism. For a particular stock there may also be company-specific good or bad news that causes the market's willingness to pay more or less for earnings, which he calls valuation resets. He thus establishes a reasonable trading range for any purple stock. The signal to buy is when the price goes above the upper bound and to sell below the lower bound. 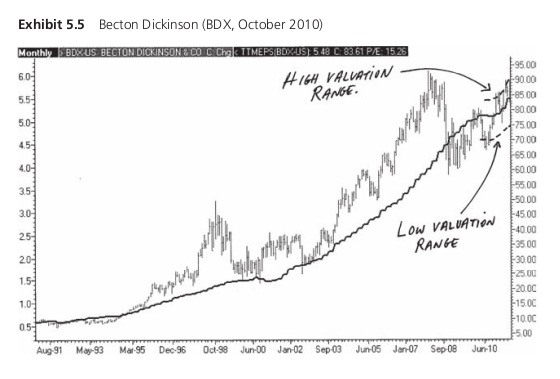 All this is summarized graphically on a chart which overlays EPS and stock price, such as the image below taken from the book. That is the gist of his method, though there are more rules, which he explains, to fine tune the buying and selling decisions as well as for building a portfolio of such stocks (such as not exceeding 15% invested in any sector, or 3% in a non-dividend paying stock). 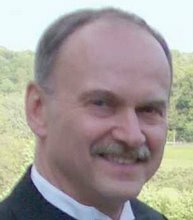 Schwinghamer's system is unique but he takes the trouble to show how its conclusions about stock value are the same as a traditional fundamental financial and ratio analysis would come up with. Schwinghamer's book is graced with clear direct informal writing including helpful analogies, with progressive and well-organized exposition from a very low assumed knowledge base to the somewhat intricate level of his unique system and with numerous charts and real stock examples (a whole chapter is devoted to several case studies that walk through valuation resets and buy/sell decisions, as well as profits thereby attained). data availability and manipulation - he uses his Bloomberg professional terminal to quickly pull up and chart the trailing 12-month EPS for seven years against stock price; try to do that with Yahoo Finance, Google Finance, ADVFN, GlobeInvestor, your discount broker's version of stock research tools, or any other free online website. 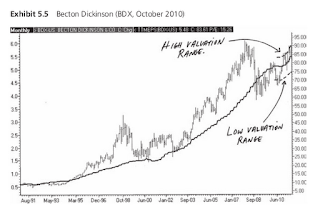 The actual mechanics of the method are a bit complicated and subject to some judgement, especially the business of valuation resets and setting the exact location of the high-low price points. The author's explanation in an email response to my query was "The placement of the projected EPS line does influence the buy/sell targets. Keep in mind that this methodology has two objectives: 1) to lead you to invest in companies that have great earnings profiles and 2) to give you a high probability of buying low and selling high." i.e. it is approximate, not exact. Schwinghamer also warns that his method does not pretend to guarantee profitable trading every time on every stock. It is meant to work on average over multiple stocks and trades. Probably it would become easier after some time working with the method. 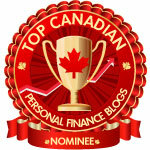 Those who might be interested in the method but are looking for an easy way to follow it can check the book's website where the Top Picks tab shows both the top 25 US and top 10 Canadian picks with current High or Low price assessment. With free membership registration, all 233 US and 41 Canadian Purple Chips are available. The method is intriguing and makes a lot of sense and the book does a fine job explaining the method. Any investor considering buying individual company stocks, and especially those who believe in fundamental analysis, can benefit from reading the book and checking out the stocks named in the website. As I discovered on my other blog looking at the stocks in the Purple Chip list, there is considerable overlap with holdings in low volatility ETFs and a fair degree of overlap with stocks arising from various methods that seek out worthwhile companies. My rating: Excellent book, 4 out of 5 stars. Thanks for the useful insight. Keep up the good work! It would be really interesting to see what the author's track record is with this system. Too many "shoulds" in my opinion.